I had the privilege of meeting Fingle (meaning gentle) in February for the first time. Unfortunately he was just not him self- he had not eaten in days and was very lethargic. On physical examination, his abdomen was firm and distended and his colour was pale. We check colour on the gums of a pet where there is not pigment- normal is pink. At he clinic, we took abdominal x-rays and did blood work in the laboratory. The x-ray showed a large mass in the liver/spleen area of the abdomen. We performed an exploratory laparotomy – an exploratory abdominal surgery. Fingle had a very large and ruptured mass within his spleen. We performed a splenectomy – we removed his entire spleen. As in people, dogs can do very well without their spleen and can live a normal life after spenectomy. Fingle’s spleen was starting to rupture and if it had been left, would have caused internal bleed that is life threatening. Fingle had a great recovery after surgery and with a few days was back to his easy going and gentle self. 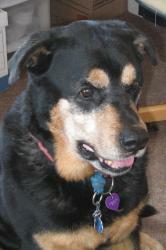 An absolutleyy gentle and regal Rotti cross, he quickly endeared himself to all the staff who fell in love with him. Masses within the spleen are fairly common – particularly in middle aged, large breed dog. They are often present in the same way: sudden lethargy, bloated abdomen, pale colour and poor appetite. If treated in a timely manner, surgery can these cases before internal bleeding. The mass can be either benign or malignant. We are have the pathology results from Fingle’s mass as a benign hemengioma. The splenectomy has cured Fingle’s condition and we except him to have many more healthy years. We thank Jim and Mitch for their excellent care of Fingle and allowing us to publish his case. We hope this will help save the lives of other dogs with similar conditions.